It's been a long time since I posted anything new! In-between two family expansions (the second one less than a fortnight ago!) and non-aviation-related work, I did manage to get some aviation art done, though. Here is the first of over a dozen of images, both 3D scenes and 2D profile art, which I created for Ian Allan's upcoming book about Japanese x-planes in the popular Midland Publishing Secret Projects series. I was lucky enough to be commissioned the front cover illustration, which is the image shown here. It is the first aviation art image I've made using Mental Ray. I've dubbed the image "Slice & Dice". The scene is entirely speculative and shows a what-if "1946" scenario high over Japan. 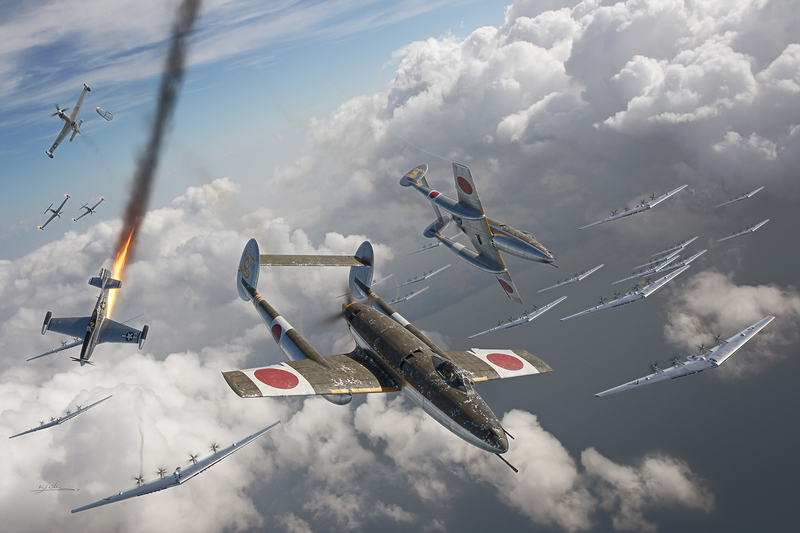 Having slashed their way through the ramjet-equipped P-51D Mustang escorts, a pair of Japanese Manshu Ki-98 fighters is diving on a formation of B-35 flying wing bombers. At the time of Japanese surrender in August 1945, all three aircraft were very much in prototype status and none would ever become operational. The Ki-98 was never finished and, though extensively test-flown, neither the B-35 nor the ramjet-equipped Mustang were found suitable for operational service. Once the book is released (planned for October this year), prints and t-shirts will become available on my new webshop at [url]http://www.digitalaviationart.com[/url] and I will post more of the other artwork I created for the book.